So recently I read an article over on the Examiner.com about how Major Nelson is not sure whether or not the XboxOne and Xbox360 will be cross voice chat compatible. And to quote him, he says: “I need to talk to the engineers, but for the reasons mentioned above it will be challenging.”. This quote was taken from Reddit, and even when someone reminded him that Don Mattrick (bless his soul), “confirmed” that the two would be able to voice chat, he issued the same answer again. Why are they so unclear whether or not Xbox One and Xbox360 can communicate over voice? They have around 5 months till the release of their console, and I think a little detail on communication would be something rather easy to answer. Seeing how its already this late in the game, I don’t believe that the cross voice chat function will exist. I believe one of the main reasons why we won’t see this feature come to light, is because Microsoft doesn’t want you to be able to do anything with Xbox One from Xbox 360. This includes playing AND communicating between the two. The reason behind this, is because they want you on the Xbox One. There is more money to be made if they get people to migrate over to their new platform. Additionally, remember how they boasted their cross platform play between Games for Windows Live and Xbox360 users? Both PC gamers and Xbox360 users were able to CROSS PLATFORM PLAY…AND VOICE CHAT with each other. SteamWorks and PSN gamers were able to CROSS PLATFORM PLAY…AND VOICE CHAT with each other on titles such as Portal 2 and Counter Strike: Global Offense. Now, many Xbox & Microsoft…enthusiasts…are already making excuses for Microsoft, and why this feature might not see the light of day. And frankly, guys, its time to stop making excuses for Microsoft. Its OK for you to demand something as simple as voice chat from them. 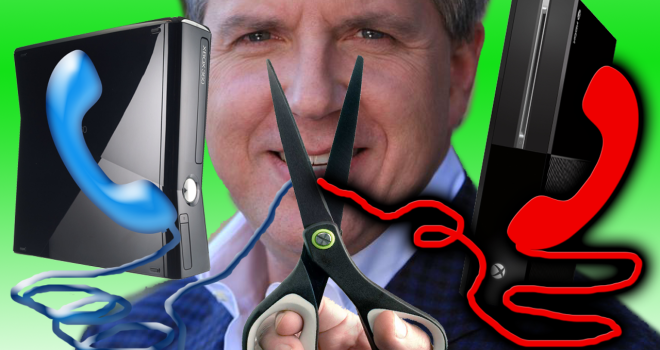 Hell, if the NSA can tap Skype calls, which is what the XBOX ONE USES (KEEP THAT IN MIND FOLKS! ), then I’m sure there is a simple codec conversion that they can implement to get the cross voice chat working. If the consoles themselves can’t do it, THEN USE THE POWER OF THE CLOUD! All jokes aside, we know Microsoft’s specialty is software development (excluding games), so I’m quite confident that they have the capability to do it. But for now, all we can do is wait and see if they WANT to do it. This guy really does not like Microsoft lol.